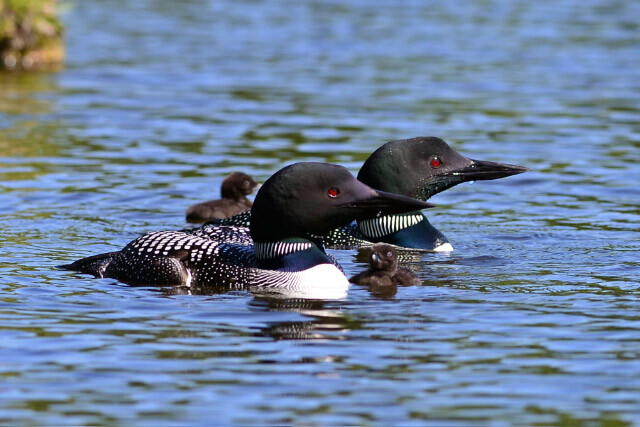 Good news on loon nesting in New Hampshire so far this summer: Lake Sunapee had a successful nesting for the first time in decades, as reported by NHLakes in their most recent newsletter. And a local loon watcher sent me some fabulous pictures taken by photographer Kittie Wilson of two loon chicks on Pleasant Lake in New London. Furthermore, the loons that were the subject of the "Loon Cam" one the Loon Preservation Committee's web site also fledged at least on chick - a good start for the season. The nesting loons on Lake Wicwas are several weeks behind these early birds, but with care from us humans and some help from nature, we can hope to have our own loon chicks in a couple more weeks. The rain the past week raised the lake level a bit but not a enough to be a problem. Let's hope all the rain today doesn't flood the lake any more. There are a couple of boards in the dam right now which can be removed to help maintain the level. Our local loon watchers will be attentive to this; the town of Meredith has been most cooperative in maintaining a favorable lake level. A few weeks ago I blogged about an encounter with a raccoon. Well, Bruce Bouley had a similar encounter, but his was in broad daylight, rather unusual for a raccoon. Bruce said the animal didn't appear to be sick, but he was able to get a great picture which he offered for the blog. Rabies decimated the raccoon population several years ago, and is something to be aware of when animals exhibit unusual behavior; I haven't heard of any such problems recently. There is starting to be a lot of color on the water now - on a kayak trip along the edges of the lake I noticed that the Rose Pagonia are blooming in the marshes. And of course, the water lilies are coming out, first the Yellow Pond Lilies. The Sweet White Lilies will follow shortly. These water plants are plentiful, and thankfully are native species. 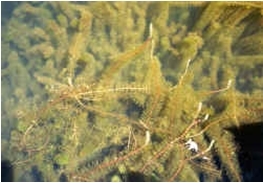 In addition to the good news about loons, the most recent NHLakes newsletter also provided some bad news regarding invasive species: milfoil has infested another New Hampshire lake, this time Turee Pond in Bow. Turee Pond doesn't have either a Lake Host program or a Weed Watcher program, so by the time the invasion was discovered it was well established and probably can't be eradicated. (Read the NH DES report here.) Fortunately Lake Wicwas has dedicated volunteers who support both these programs, and everyone who uses the lake can help. If you ever see any weed growth that looks unusual or in any way of concern, please report it - to a Lake Host, to a Lake Wicwas Association board member, or to Amy Smagula at the NH Department of Environmental Services. They would much rather have a false alarm than miss an early detection opportunity. As for the animals, they were a little shy this week - except for the chipmunks which seem to be having a population explosion. Where are all those hawks and foxes! But I did find this Gray Catbird foraging in the undergrowth beside the lake one morning. The catbird is member of the Family Mimidae - as is the mockingbird - and it has the ability to mimic other birds, and even frogs and toads. But its call (versus its song) is eerily similar to that of a cat. So if you ever hear a cat calling from deep in the forest underbrush around the lake, look carefully and you may find a bird instead. And while you're looking in the next few weeks, keep an eye out for milfoil - and baby loons!